Russ McRee's HolisticInfoSec™ includes articles and research, as well as feedback and an occasional rant. HolisticInfoSec™ promotes standards, simplicity, tooling and efficiency in achieving holistic information security. Embrace this simple fact, we’re all owned. Maybe you aren’t right now, but you probably were at some point or will be in the future. “Assume compromise” is a stance I’ve long embraced, if you haven’t climbed aboard this one-way train to reality, I suggest you buy a ticket. If headlines over the last few years weren’t convincing enough, Mandiant’s APT1, Exposing One of China’s Cyber Espionage Units report should serve as your re-education. As richly detailed, comprehensive, and well-written as it is, this report is groundbreaking in the extent of insights on our enemy it elucidates, but not necessarily as a general concept. Our adversary has been amongst us for many, many years and the problem will get much worse before it gets better. They are all up in your grill, people; your ability to defend yourself and your organizations, and to hunt freely and aggressively is the new world order. I am reminded, courtesy of my friend TJ O’Connor, of a most relevant Patton quote: "a violently executed plan today is better than a perfect plan expected next week." Be ready to execute. Toolsmith has spent six and half years hoping to enable you, dear reader, to execute; take the mission to heart now more than ever. I’ve covered Mandiant tools before for good reason: RedCurtain in 2007, Memoryze in 2009, and Highlighter in 2011. I stand accused of being a fanboy and hereby render myself guilty. If you’ve read the APT1 report you should have taken immediate note of the use of Redline and Indicators of Compromise (IOCs) in Appendix G.
“Working side by side with the folks here at Mandiant who are out there on the front lines every day is definitely what has driven Redline’s success to date. Having direct access to those with firsthand experience investigating current attack methodologies allows us stay ahead of a very fast moving and quickly evolving threat landscape. We are in an exciting time for computer security, and I look forward to seeing Redline help new users dive headfirst into computer security awareness. 1. Memory analysis from a live system or memory image file. Great for malware analysis. 2. Collect and review a plethora of forensic data from hosts in order to investigate an incident. This is commonly referred to as a Live IR collector. 3. 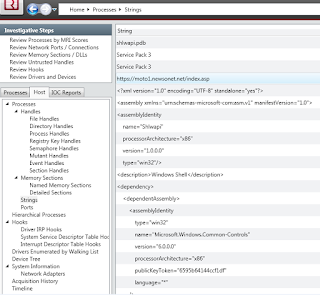 Create an IOC search collector to run against hosts to see if any IOCs match. He went further to indicate that while the second scenario is the most common use case, in light of current events (APT1), the third use case has a huge spotlight on it right now. This is where we’ll focus this discussion to utilize the APT1 IOC files and produce a collector to analyze an APT1 victim. 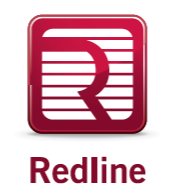 Mandiant provides quite a bit of material regarding preparation and use of Redline including an extensive user guide, and two webinars well worth taking the time to watch. Specific to this conversation however, with attention to APT1 IOCs, we must prepare Redline for a targeted Analysis Session. 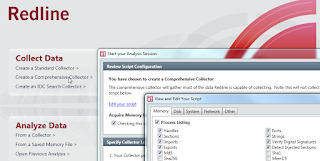 The concept here is simple: install Redline on an analysis workstation and prepare a collector for deployment to suspect systems. To begin, download the entire Digital Appendix & Indicators archive associated with the APT1 report. Wesley McGrew (McGrew Security) put together a great blog post regarding matching APT1 malware names to publicly available malware samples from VirusShare (which is now the malware sample repository). I’ll analyze a compromised host with one of these samples but first let’s set up Redline. I organize my Redline file hierarchy under \tools\redline with individual directories for audits, collectors, IOCs, and sessions. I copied Appendix G (Digital) – IOCs from the above mentioned download to APT1 under \tools\redline\IOCs. 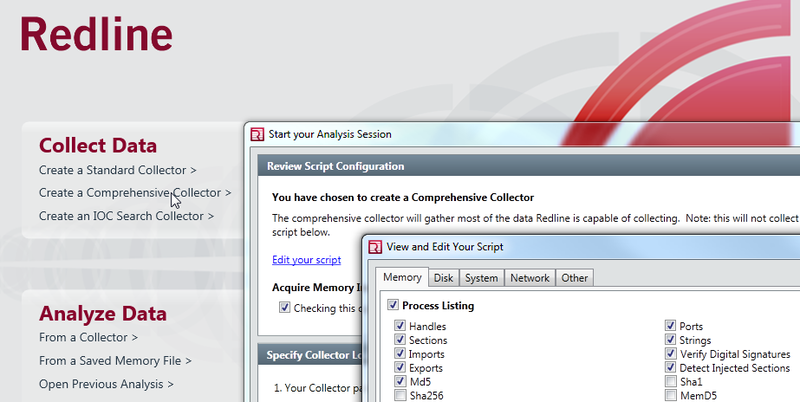 Open Redline, and select Create a Comprehensive Collector under Collect Data. Select Edit Your Script and enable Strings under Process Listing and Driver Enumeration, and be sure to check Acquire Memory Image as seen in Figure 1. I saved the collector as APT1comprehensive. These steps will add a lot of time to the collection process but will pay dividends during analysis. 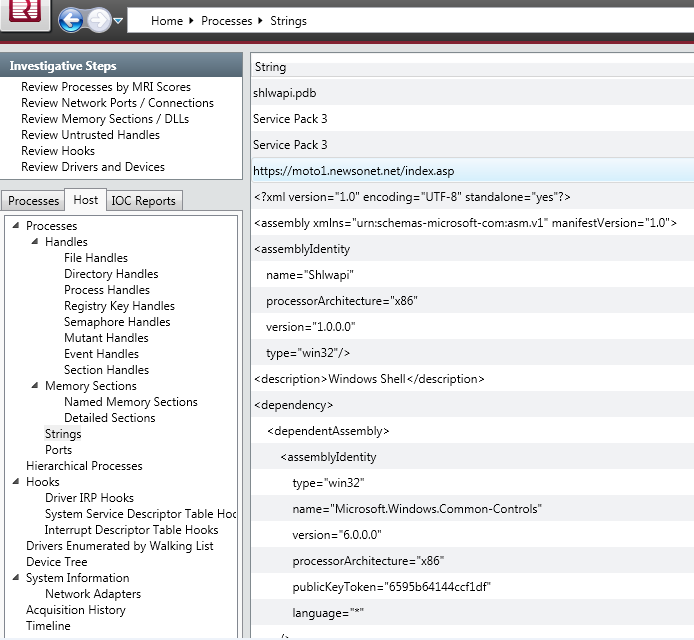 You have the option to build an IOC Search Collector but by default this leaves out most of the acquisition parameters selected under Comprehensive Collector. 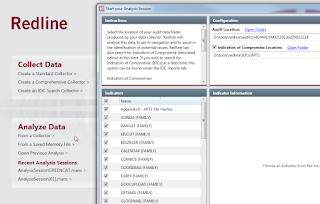 You can (and should) also add analysis inclusive of the IOCs after acquisition during the Analyze Data phase. I grabbed the binary 034374db2d35cf9da6558f54cec8a455 from VirusShare, described in Wesley’s post as a match for BISCUIT malware. BISCUIT is defined in Appendix C – The Malware Arsenal from Digital Appendix & Indicators as a backdoor with all the expected functionality including gathering system information, file download and upload, create or kill processes, spawn a shell, and enumerate users. I renamed the binary gc.exe, dropped it in C:\WINDOWS\system32, and executed it on a virtualized lab victim. I rebooted the VM for good measure to ensure that our little friend from the Far East achieved persistence, then copied the collector created above to the VM and ran RunRedlineAudit.bat. If you’re following along at home, this is a good time for a meal, walking the dog, and watching The Walking Dead episode you DVR’d (it’ll be awhile if you enabled strings as advised). 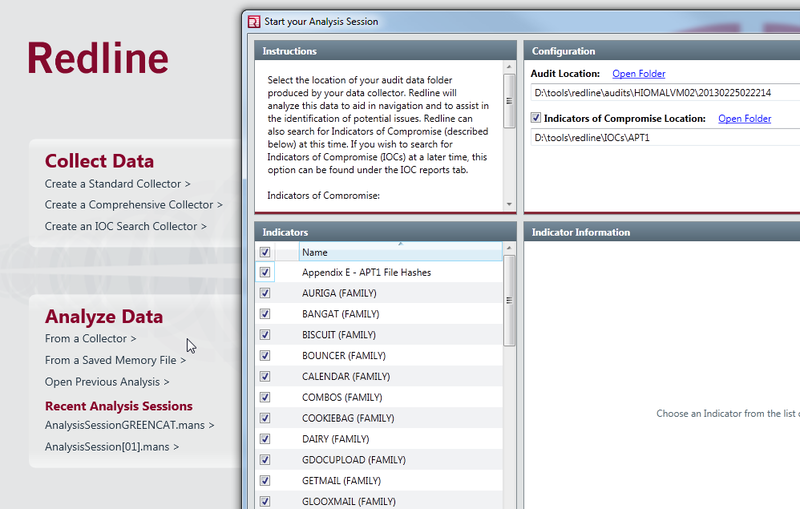 Now sated, exercised, and your zombie fix pulsing through your bloodstream, return to your victim system and copy back the contents of the audits folder from the collector’s file hierarchy to your Redline analysis station, select From a Collector under Analyze Data, and choose the copied audit as seen in Figure 2. Sweet, we see a file hash hit and a BISCUIT family hit as seen in Figure 3. Your results will also be written out to HTML automatically. See Report Location at the bottom of the Redline UI. Note that the BISCUIT family hit is identified via UID a1f02cbe. Search a1f02cbe under your IOCs repository and you should see a result such as D:\tools\redline\IOCs\APT1\a1f02cbe-7d37-4ff8-bad7-c5f9f7ea63a3.ioc. In the Redline UI, remember to click the little blue button with the embedded i (information) associated with IOC hit for highlights on the specific IndicatorItem that triggered the hit for you and displays full metadata specific to the file, process, or other indicator. But wait, there’s more. Even without defined, parameterized IOC definitions, you can still find other solid indicators on your own. I drilled into the Processes tab, and selected gc.exe, expanded the selection and clicked Strings. Having studied Appendix D – FQDNs, and checked out the PacketStash APT1.rules file for Suricata and Snort (thanks, Snorby Labs), I went hunting (CTRL-F in the Redline UI) for strings matches to the known FQDNs. I found 11 matches for purpledaily.com and 28 for newsonet.net as seen in Figure 4. Great! If I have alert udp $HOME_NET any -> $EXTERNAL_NET 53 (msg:"[SC] Known APT1 domain (purpledaily.com)"; content:"|0b|purpledaily|03|com|00|"…snipped enabled on my sensors I should see all the other systems that may be pwned with this sample. Shake off slumber, and beware. I am calling you to action and begging of your wariness; your paranoia is warranted. If in doubt of the integrity of a system, hunt! There are entire network ranges that you may realize you don’t need to allow access to or from your network. Solution? Ye olde deny statement (thanks for reminding me, TJ). Time for action; use exemplary tools such as Redline to your advantage, where advantages are few. Ping me via email if you have questions or suggestions for topic via russ at holisticinfosec dot org or hit me on Twitter @holisticinfosec. The views expressed here are mine alone unless clearly cited as those of others. Russ McRee runs the Blue Team for Microsoft's Windows and Devices Group (WDG). He writes the monthly column toolsmith. Russ has spoken infosec events such Defcon, Black Hat, RSA,and FIRST and has published in the likes of Information Security, Linux Magazine, (IN)SECURE, and SysAdmin. As an advocate of a holistic approach to information security, Russ' website is holisticinfosec.org. He also serves as a volunteer handler for the SANS Internet Storm Center.